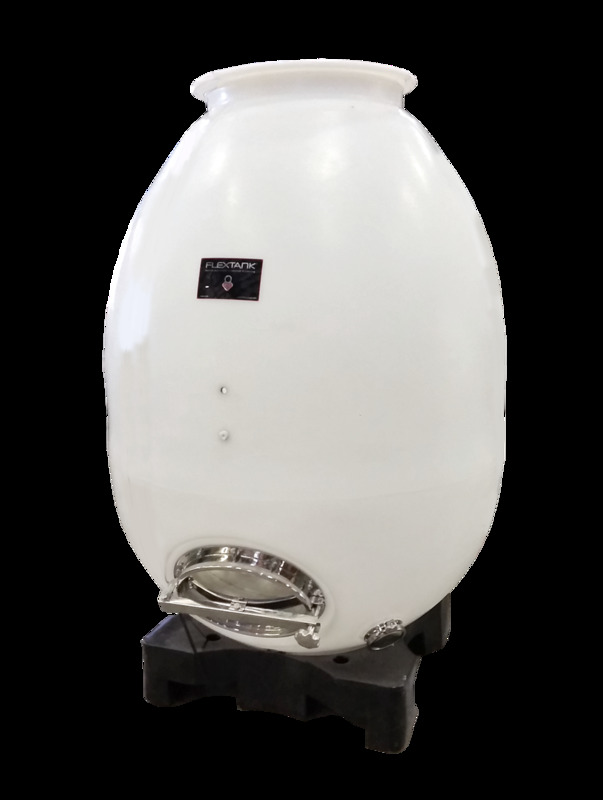 A current trend in winemaking is the Egg shaped tank. Winemakers report superior fermentation results in these tanks due to the shape promoting both internal convection mixing and cap concentration. Principally designed as a 2 ton closed fermentor, the ORION Tank may also be used for long term storage. As a fermentor, the ORION offers a number of advantages over open bin ferments. The Orion has molded in recesses in the bottom of the tank that index into protrusions on the base. The Tank is molded in natural translucent white with the included Pallet Base in black. The Pallet Base has a pass through hole on center in which the Orion can be accessed from underneath and fitted with an optional 4'' or 2'' cleanout. Top lid: 28'' diameter polyethylene lid fitted with an inflatable gasket and hand pump. 2'' NPT threads except our blank bung and FL1 (included) . BH4 - Bulkhead Fitting Kit 2.0 in. VF4 - Valve Flange 4.0 in. VF2 - Valve Flange 2.0 in. Copyright ©2019 Flextank, Inc. All rights reserved.